The Great Planes Spectra is basically an electrified version of their 2-Meter Spirit. That makes the Spectra yet another one of my Spirit sailplanes. The 400-size brushed motor that came in my Spectra kit was really a piece of crap. The commutators would load up with carbon from the brushes so badly after every couple flights that I had to disassemble and clean them repeatedly. It was a major pain in the rump. If the Spectra had not met with an unfortunate end, I would have replaced it with a brushless motor. 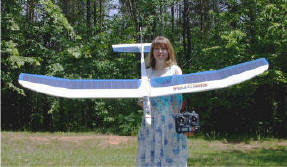 In fact, I later modified a 2-Meter Spirit to use an E-flite brushless motor and electronic speed control. I decided to try my hand at electric flight and purchased Great Planes Spectra electric powered sailplane while in Loveland, CO, and was able to fly it from an expansive field adjacent to my back yard. The only obstacles to avoid were the cow pies. The Spectra is basically a 2-meter Spirit, with a motor and prop up front. I think it was a 400 size. Rather than use the servo-actuated on-off switch, I used an electronic speed control (ESC). The motor was a real piece of garbage. After about 4 or 5 motors runs, the brushes began fouling with a hard crust layer after every run. It always involved disassembling the motor and cleaning the brushes. I got so fed up with it that I just stopped flying it. We then moved to Kernersville, NC, where we now still live. I dusted off the Spectra and flew it a few times at a local elementary school. On one ill-fated flight in the winter, my aging eyes told me the Spectra was in front of a big oak tree while on a landing approach, when in actuality, the oak was between my Spectra and me. Needless to say, I was quite shocked when the beast came to a sudden halt and tumbled to the ground. The experience was rather strange because the tree was far enough away that I saw the plane hit before the noise from the crunching of the branches reached my ears (my eyesight is terrible, but my hearing is still very good). 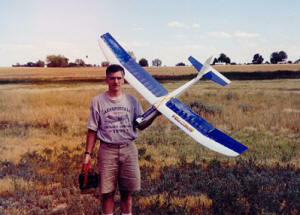 The Hitec radio system in my Great Planes Spectra was the only non-Futaba RC system I have purchased in many years. The receiver had a very annoying feature where it would crank the servos over way past the normal maximum servo throws if the transmitter was shut off before shutting off the receiver. Since then, I have bought a Spektrum DX6 spread spectrum radio system, but all others are Futaba. Great Planes still sells the Spectra both as a kit and as an ARF. The ARF is only $30 more than the kit, which is about the cost of the covering and adhesives - amazing. Those impoverished Chinese workers sure can turn these things out cheaply. Next time you fly an ARF, thank a Chinaman who earned half a bowl of rice for his efforts.